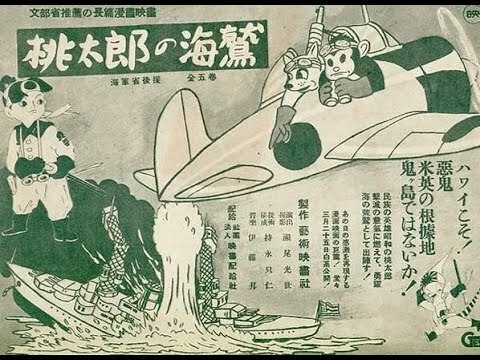 "Momotarō's Sea Eagles" 1943 - Momotarō no Umiwashi (桃太郎の海鷲, translating to "Momotarō's Sea Eagles") is an animated Japanese propaganda film produced in 1942 by Geijutsu Eigasha but wasn't released till March 25 1943. The film was not produced with the cooperation of the Japanese Naval Ministry, to protect military secrets but the Japanese Imperial Navy endorsed the it. "Momotarō's Sea Eagles" depicts the Pearl Harbor Surprise Attack as the Japanese viewed it during the war. It features a character from Japanese folklore known as "Peach Boy" but is named Momotaro in the film. The other characters are shown as Asian species of wildlife such as;dogs, rabbits, monkeys, bears, pheasants..The film tells the story about these characters being in a naval unit and their mission to attack the demons (Americans and British) of the island called Onigashima. The attack is a dramatization of the actual Pearl Harbor Attack and even utilizes footage from the surprise attack. Bluto, from the Popeye series, was used in the film depicting a violent drunken American sailor, to further demonize the Allies.